The Great White for in-ground pools is the only automatic pool cleaner that scrubs with its double rows of directional bristles that loosen dirt, using its bristle footpad as it devours debris, both large and small. The unique bristle drive automatically propels the cleaner to give your pool bottom complete cleaning coverage. The Great White has a unique turning mechanism that allows escape from difficult areas and obstacles. The cleaning path and specially designed steering mechanism provides excellent pool coverage. This cleaner is well suited for flat, dish, incline and hopper-bottom pools. The Great White 9500 installs in minutes, requires no specialized tools and costs less to run and maintain. Do not use in pools deeper than 6' deep. 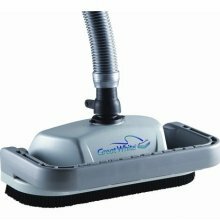 The Great White GW9500 for in-ground pools is the only automatic pool cleaner that scrubs with its double rows of directional bristles that loosen dirt, using its bristle footpad as it devours debris, both large and small. The unique bristle drive automatically propels the cleaner to give your pool bottom complete cleaning coverage. The Great White has a unique turning mechanism that allows escape from difficult areas and obstacles.